No you aren't seeing things, this high-quality piece is available at a very affordable price, and if you can find it lower, let us know and we will match it. 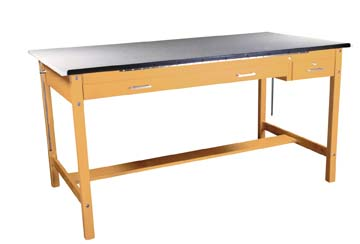 DIVERSIFIED WOODCRAFTS Instructor's Art/Drafting Table - 72"W You would be hard pressed to find a better built, higher quality, and more complete drafting table at this price anywhere on the market place. Fashioned from durable and beautiful maple, this table is the perfect balance of soft and hard. With a full tilting 3/4'' Fiberesin top, this versatile piece is a drafting dream for amateurs and professionals alike. The top also includes pencil stop tilts. Other must have features include a shallow print drawer, tool drawer, and dust cover, so you can be sure you have everything you need to succeed. Built to last, the multilayered lacquering on this already sturdy wood seals in the strength and makes this piece resistant to every element, whether it be heat, cold, or the most destructive element of all, students. You can rest easy knowing this piece will last as long as you do.